Acer’s success depends on the trust our customers have in us. Since the company’s founding, we have demanded of ourselves constant improvement in quality. From product design through production to after-sales service, we continually strive for innovation and improvement, all while also complying with domestic and foreign legal requirements for performance and customer safety. 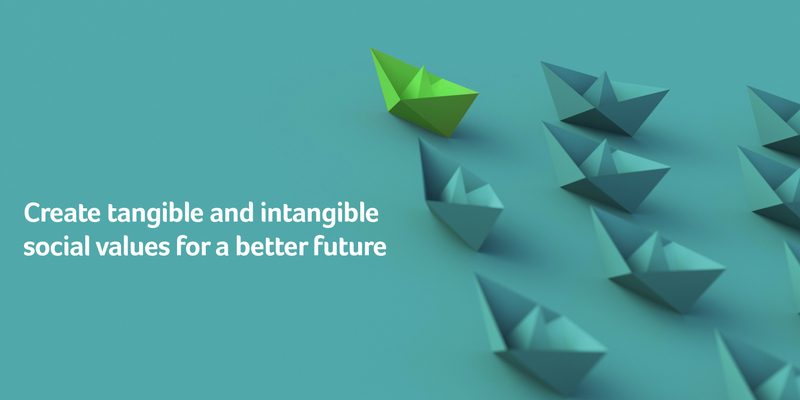 Acer’s vision is to become a leading brand that creates better lives through innovation and customer care. We firmly believe in the pursuit of quality in everything we do, and that this approach will ensure we remain competitive. To ensure our customers are satisfied, we actively strive to understand their needs and to develop better, easier to use products and services that meet, or even surpass, expectations. In this way, we create greater value for our customers. 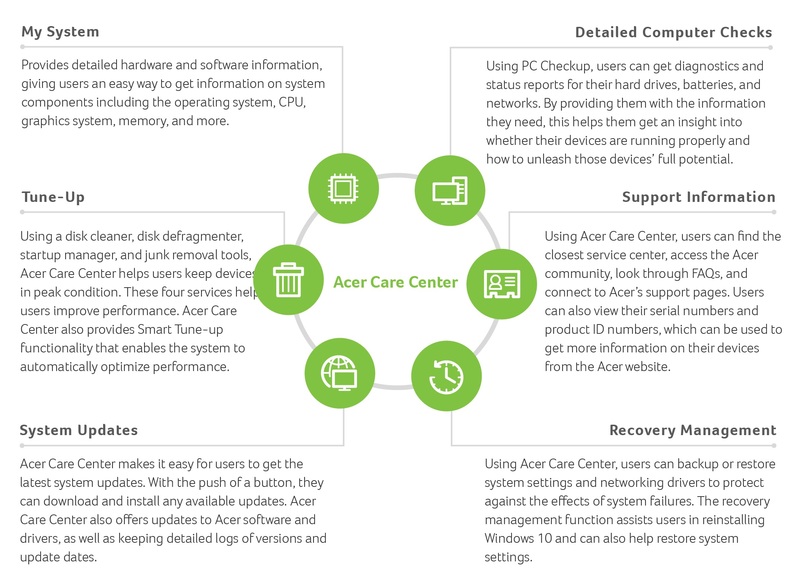 The Acer Care Center (ACC) is a software suite for optimizing Acer notebooks and desktops, helping users keep their devices in top condition. ACC can also link users to Acer’s support team to get them the assistance they need. ACC provides comprehensive service, including checks and updates, ensuring users can keep their devices up-to-date and running smoothly. In late 2012, Acer launched the Acer Community website, providing customers with an online communications channel that enables them to post their problems at any time and receive prompt, accurate responses from Acer Community members. The website supports multiple languages, including English, Spanish, German, and Portuguese, providing channels that span borders. Additionally, in late 2013 we added Acer Idea, a channel for all registered members to put forward their ideas for products, accessories, and services, including product hardware or software improvements, more customer-friendly web pages, and so forth. A total of 228 innovative ideas have been shared through this channel. 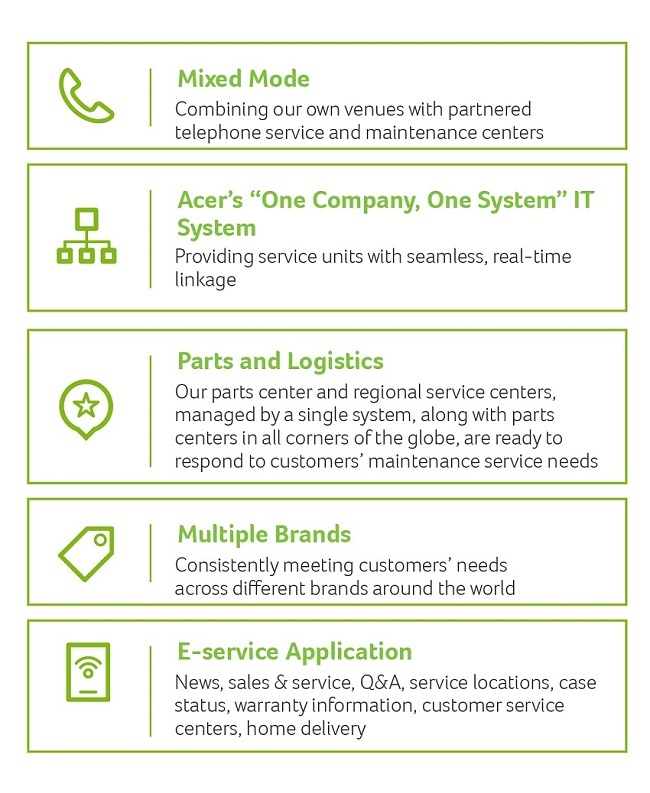 These ideas help Acer understand what our customers need, knowledge that can be applied in later product development and service improvements. The Acer Product Evaluation Program (APEP) is a product testing program that allows expert members of the Acer Community to test out the latest products. Their feedback can then help us improve our products and be more innovative. Relevant departments, including the management team, marketing, and UX, evaluate and discuss user feedback and lay out plans for improvements. To facilitate our worldwide customer service staff’s provision of the best customer advice and assistance, we established an online learning system (Acer eAcademy) in 2009 to provide professional knowledge training in new products, resolution of common product queries, customer skills, and standard processes to front-line customer service employees and operating unit employees, including an online evaluation after the course has finished. 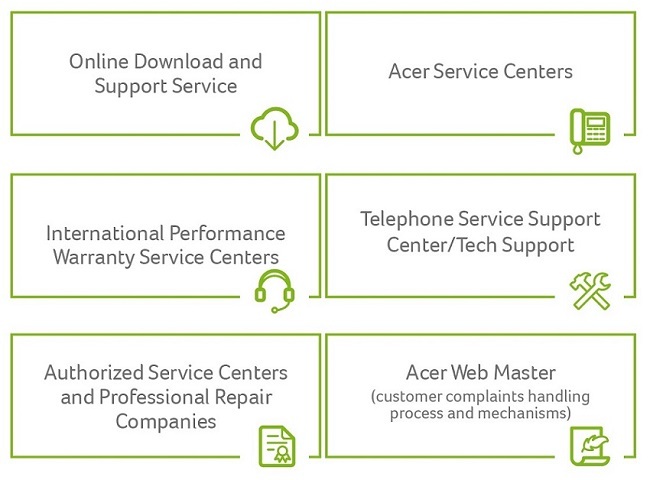 Currently, Acer eAcademy provides more than 7,700 employees and partners around the world access to the latest product information, equipping them to provide better customer service. In 2017, Acer Europe offered nine courses, the goal of each being to help staff more effectively deal with customer inquiries through a set of standard methods and to enable the participants to fully understand each product through a virtual journey, even without seeing the actual product. Acer understands the importance of the protection of personal information and privacy to our clients, and as such we consider our policies on personal information protection and privacy to be a priority. All Acer employees are required to carefully protect confidential or proprietary information provided by customers, and our products make use of data security technology. 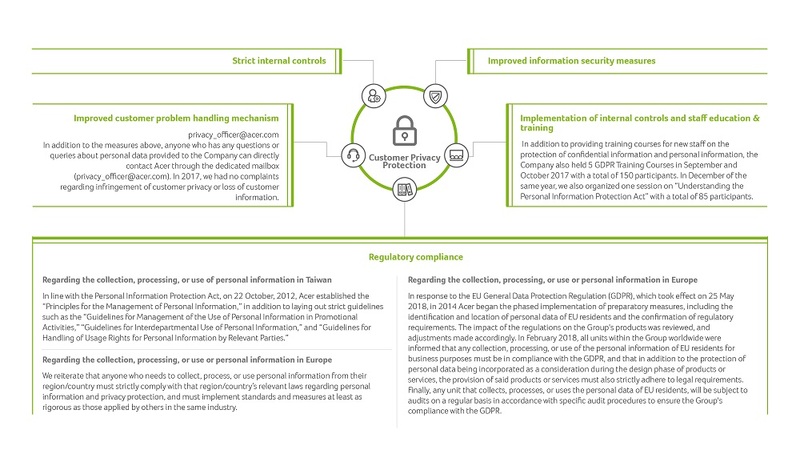 However, both technology and the risk of hacking or intrusion into systems are always changing, and so in addition to continually reviewing the necessity for collecting customer information and strengthening information security protection measures, the Company also seeks to distribute risk through information security protection systems in order to provide an additional layer of privacy protection. We carry out Acer Customer Satisfaction Surveys in each country individually. As such, methods can vary. 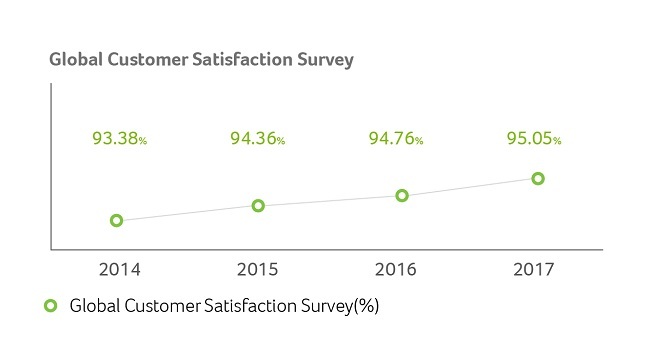 However, head office still regularly collects the results of our surveys and reviews them for trends and insights. The four main methods by which these surveys are carried out are by telephone, online, face-to-face, and through telephone discussions with major corporate customers. In terms of customer type, we categorize them as either end users or retailers. In aggregate, our 2017 survey results show high global satisfaction, with positive customer evaluations accounting for 95.05% of total evaluations. Thanks to our excellent customer service, in 2017 Acer won several awards from around the world. For example, we were named Best Service Brand for the 12th year running by Chinese magazine Popular Computing Weekly. We also won the Outstanding Merchant Award from JD.com for the second consecutive year. 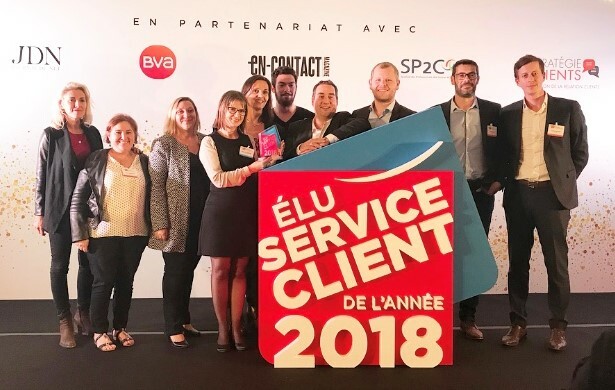 In addition, we earned annual national customer service awards in countries including China, the Netherlands, France, Switzerland, Germany, and Czechia.